To structure the book, Neuhaus devotes one chapter apiece to each of the sayings, interpreting each around a single point. The result is truly a prophetic book. I call it prophetic intentionally, using a word that is overused and misused, because in this book the Jesus of the Scriptures, of human history, of the Great Tradition, of the Godhead, is proclaimed as the Jesus who speaks to our world today. These are the kind of words that Hebrews 4 describes as “living and active, sharper than any two-edged sword, piercing until it divides soul from spirit, joints from marrow…able to judge the thoughts and intentions of the heart.” We may not want to hear them, because we might get cut. One very distinct message across the chapters which I did not expect to find here: Neuhaus believes that when we look deeply at Christ crucified, we will find in his suffering and death the hope of salvation for all. Here, Neuhaus’ understanding follows very closely on Hans Urs von Balthasar’s Dare We Hope “That All Men Be Saved”? in arguing that love of neighbor and faith in a God who is love mean that Christians are on entirely solid theological and Biblical footing when we hope that Christ’s work will result in an empty Hell. This hope of universal salvation through Christ is raised repeatedly and strongly throughout the book. It is a question, but it is an inescapable question, that drives to the hope at the heart of the horror. If, as St. Paul says, Christ who knew no sin was made sin for us, can there be any sin he did not bear there on the cross? If the answer is no, as I believe it must be, then even the utterly forsaken one are not bereft of the company of the utterly forsaken one, the Son of God, and therefore not bereft of hope. Thus even the will to damnation is damned and thereby defeated by the One for whom and in whom damnation is not allowed the last word. It is a powerful argument, because it makes those of us still unsure how to think of Hell within the love of God ask of ourselves, “Does the power of the cross fall short at some point?” It also make powerfully clear that from St. Paul to Jesus’ own words to other writers of the New Testament to theological giants including Aquinas and von Balthasar, there is some solid footing to hope. 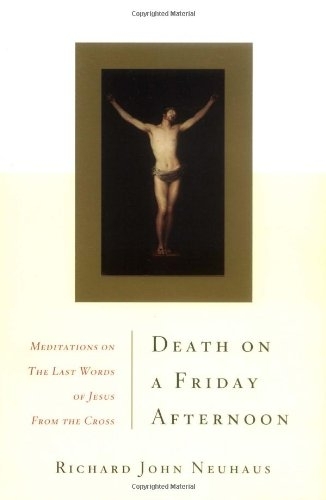 Death on a Friday Afternoon, finally, is the kind of book that makes it harder for me to preach after reading, because I find my own words flogging the afflicted and leaving no one comforted in comparison. I recommend the book unreservedly, although it certainly (as you can see from the quoted portion) is heavy reading for many audiences.